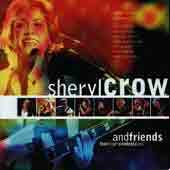 Sheryl Crow and Friends Album reviews. I had a nightmare before Christmas. During it, I got downstairs on Christmas morning and the first thing I came to with my name on it was a CD. I knew it was a CD because granny hadn't bothered to disguise it or do anything inventive with it, so I tear off the paper, expecting something that will make December 25th the most memorable day of the year. But then I see the dreaded words, "The best of Sheryl Crow". And it gets worse. I read on and find out that this is a live album. And not just a Sheryl Crow live album, one where she has dragged in her musical chums to try and turn it into some kind of Crow Aid. There's Eric Clapton helping out, along with Stevie Nicks and Chrissie Hynde. Not to forget Bill Murray, although why the hell the old Ghostbuster's role as introducer needs flagging up, I have no idea. And once I politely thanked granny for her generous efforts and pluck up the courage to put this Yule Beast on the CD player, all my worst fears are answered. Taking time off from rounding up herds of sheep at the ranch, Crow's pocketful of hits and over-confidant cow-girl attitude culminate in a performance that is not worthy of the names Clapton and Hynde. Even the parent's favourites All I Wanna Do and A Change Would Do You Good aren't enough to salvage any pride from the back-slapping and cringeworthy promises of "very special guests" that take place between tracks. By the time Tombstone Blues is on at the end, the entire cast is on stage, giving it a Wizard Of Oz fake-happy feel. Puke. The only solution was to wrap up the wretched thing and give it granny back for her birthday.